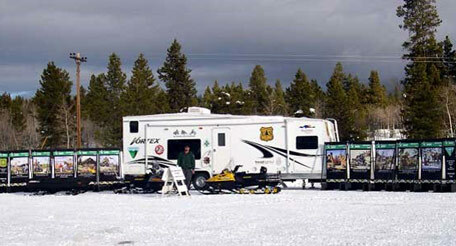 Materials within the Safety Resources section of this website are examples of some of the best snowmobile safety education materials available. Additional best practice examples are presented below. This RTP project provides a first-of-its-kind outdoor ethics and safety education "onsite" where the activities happen, as the trailer is used as a contact point, display, and mini-classroom. The trailer is also used at schools, dealer events, workshops, land manager sessions, outdoor expositions, parades, trailheads and shows to reach hard-to-contact users and all other concerned public. The first three phases of this RTP project expanded the existing daily forecast produced by the Bridger-Teton NF Avalanche Center for the Jackson Hole Mountain Resort ski area to also include data from sites heavily used by snowmobilers and other backcountry recreationists away from the ski area. The project added data collection sites in the Togwotee, Brooks Lake and Lava Mountain areas of the Continental Divide region, as well as in the Grey's River area of the Wyoming Range. Also of importance, the sites in the Continental Divide region focused on obtaining data from both the east and west sides of the Continental Divide, since wind and weather patterns can vary substantially on each side of it. The Coalition of Recreational Trail Users (CRTU) is a nonprofit organization formed by a partnership of Minnesota’s motorized recreational trail user communities composed of the All-Terrain Vehicle Association of Minnesota, the Amateur Riders Motorcycle Association, the Minnesota 4 Wheel Drive Association, and the Minnesota United Snowmobilers Association. This coalition recognized the need to educate the motorized trails communities, as well as the general public, regarding safe and responsible motorized recreation. CRTU developed a plan for an education and outreach trailer to be stocked with information on rules, regulations, safety and the state associations, as well as maps and youth safety training CDs. This RTP project has been instrumental in providing education to summer and winter motorized trail users.